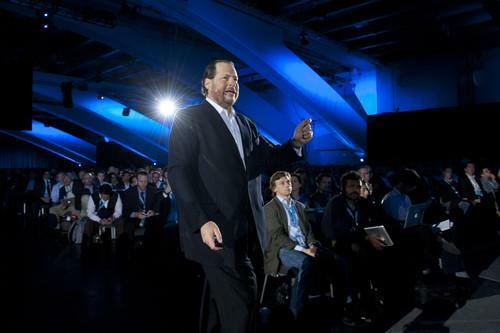 The concept of B-to-C, or business-to-consumer, is old hat, Benioff said during a keynote Tuesday at the Dreamforce conference in San Francisco. "In the world of the Internet of customers, consumers get transformed into customers." The difference is a deeper level of engagement between companies and organizations and the people they serve, Benioff said. He recalled a recent visit to his alma mater, the University of Southern California. "The last time I went there, my phone didn't light up with the USC fight song and say, 'Hi Marc,'" he said. "But it should have." This is going to change, Benioff said. "In this new world, I'm going to have a one-to-one relationship with USC," he said. "The only question is, are you ready to make that change for your customers?" Salesforce.com wants its technology to sit at the center of companies' strategies as they build out these relationships. To that end, this week the vendor announced Salesforce1, a new version of its cloud-based development platform. A key component of Salesforce1 is a new mobile application through which Salesforce.com users can get access to the company's CRM (customer relationship management), service and support software, as well as any custom applications they've built with Salesforce.com's tools and applications from third-party vendors. "We are bringing all of your investment, all of your code, everything you've done with us into the present," Benioff said. The mobile application is so powerful that Benioff is able to run the entire company using only his phone, he claimed. Salesforce1 also includes 10 times as many APIs (application programming interfaces) as before, according to the company. In addition, Salesforce1 targets a broader set of application types. The original Force.com platform has now been joined by Heroku1, a version of Salesforce.com's development platform for consumer-centric applications. Heroku1 will have access into Salesforce.com data, which can be used to build applications. Until now, Salesforce.com had kept the Heroku brand separate from Force.com since it bought the platform's namesake company in 2010. Heroku1 is set for general availability early next year. Salesforce1 also encompasses the Fuel platform that Salesforce.com gained through this year's acquisition of marketing software vendor ExactTarget. Still to come in the first half of 2014 is the ability for companies to customize the look and feel of Salesforce1's mobile application for their own companies. 'We know how important branding is," Benioff said. Overall, Salesforce1 is "a massive rebranding of the Developer platform but also a launch of a major mobile effort into enterprise mobility," IDC analyst Al Hilwa said via email on Tuesday. "Enterprise mobility is happening today as companies are investing most of their new application development efforts on mobile-related projects."